Want to break into freelance game design, but don’t know where to start? Have you already had a crack at pitching a project and failed? If so, this is the book for you! 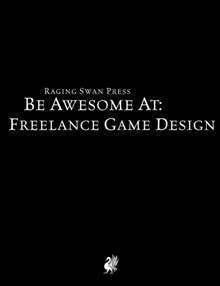 Inside, Creighton Broadhurst publisher at Raging Swan Press and an ENnie Award winning game designer reveals his hints, tips and strategies for a successful career in freelance game design. If you've always wanted to have a go at freelancing, but didn't know where to start, this book is for you! Within these pages, I've distilled my 14 years of experience in the gaming industry. I don't explain the esoteric, maddening mysteries of grammar, the hidden truths of sentence construction or the terrifying secrets of crafting a compelling story. I don’t talk about game design. You can get that all elsewhere. Instead I give you practical advice on how to work professionally, pitch to publishers and secure reoccurring work. For free samples head over to Raging Swan Press's website or Creighton's blog to learn more. Thanks for the review. I'm delighted you found the book useful. I hadn't considered the possible impact a blog would have on a day job.I'll definitely consider that if/when I revised or expand the book. Thanks again! Thanks very much for the detailed review, Kyle. I much appreciate your time and effort. I'm glad you found some useful stuff therein.